Select a tree without any low-hanging branches (for larger groups, a bush, a jungle gym, or another large structure might be more appropriate). Turn on a fun, fast-paced CD as encourage the children to run and dance very quickly around the tree. When you turn the music off, they should stop in the exact position they are in. When you first stop the music, make a big deal about the positions they stopped in. Is anyone in an awkward or funny position? Laugh about it with them. Then turn on the music and let the game continue! Stand the preschoolers in a long line and provide a string for them to hold. Tell the children that they will be following a leader and doing everything that the leader does. For example, the leader might wave her hands over her head, march like a marching band, or jump over a crack in the sidewalk. At first, an adult should lead the “chain," but in about thirty seconds a child should take over the lead. Every thirty seconds give another child a turn to lead until all of the children have had a chance. 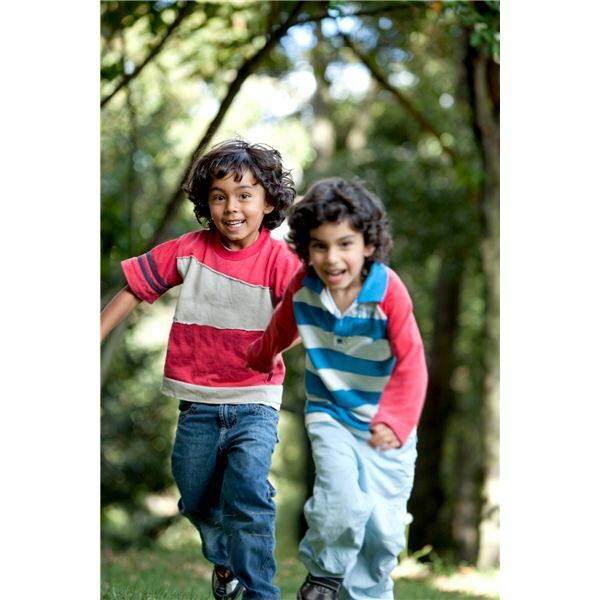 Before trying this outdoor activities and movement game, make sure that children understand certain basics about the safety – such as the importance of not running, not pulling on the string, and not attempting anything that the entire group cannot do. This version of leapfrog can help children who are practicing counting. Line the children in a row, and have them crouch down as if they are playing leapfrog. Then sing the following song to the tune of “London Bridge is Falling Down." The child in the song should be the last child in the row. Here hops [name of child]! When the child hears his name, he holds onto the shoulders of the child in front of him and leaps. After each leap, the children call out a number. When he reaches the front of the line, the game begins again. This game starts out like a regular game of tag. Make sure that children know to use a safe, two-fingered tap. When the first child is tagged, the two children join together to make a “snake," and the snake runs after the remaining children. Each child who is tagged becomes part of the snake. This game is best played within a smaller outdoor area so that the snakes greater mass gives it an advantage. Most daycare providers and preschool teachers are too afraid to put together an obstacle course; after all, it must be so much work! Think again. Preschoolers don’t need complicated obstacles, although they do need extra direction. Tie a string around a tree as a starting point, and instruct children to follow the string. You might coil the string several times, which will tell children to go in circles. You might let the string lead under a picnic table or over to a jump rope. Do the course yourself before the children try it out, and let them see what you’re doing. Expect it to take several tries for children to get it all “right," but focus more on the fun of the process and less on whether they follow each step precisely. Unlike older children, preschoolers will be happy playing on the same obstacle course over and over again. There are obvious benefits to outdoor play, including healthy exercising habits, release of excess energy, and just plain fun. However, each activity teaches preschoolers skills as well. For example, Hopping Frogs can encourage counting practice, the obstacle course can teach the importance of follow directions, and the other games give children practice in working as a team. These games can bring a group of preschoolers closer together, and you’ll probably catch them falling on the floor with laughter several times during each game. Enjoy the moment. Hot outside? Your preschoolers also might enjoy some outdoor water activities.